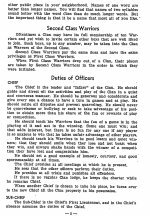 A thirty-two-page booklet containing the rules; various items relating to the Clans, including song-poems; and at the end, an English, Ape-English dictionary. The cover displayed a native chief, his savagery stressed with dangling earrings and a feather in his hair; one upraised arm flourishing a spear while the other held a shield. 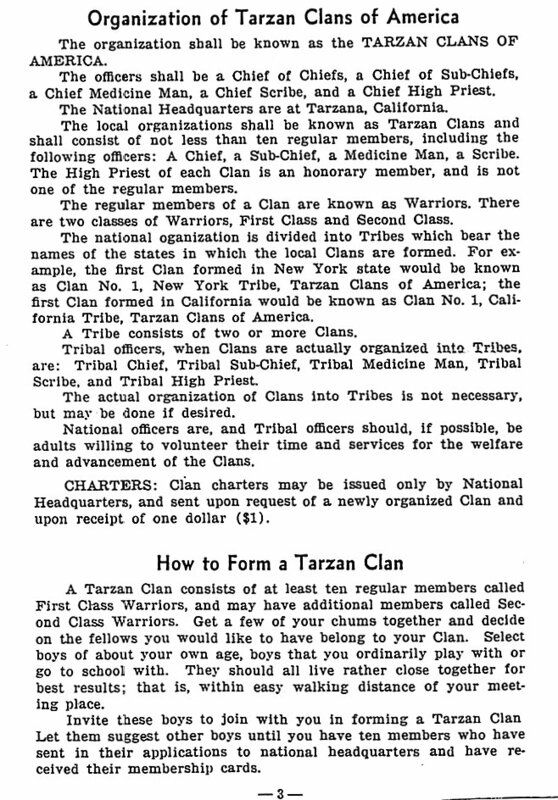 In 1939, ERB sent out circulars encouraging youngsters to join the Tarzan Clans of America. The circular named Johnny Weissmuller as Chief of Chiefs and C.R. Rothmund as Chief Scribe and it bore ERB's signature as the Founder. A membership application was enclosed, and a dollar would pay for a membership card, the Official Guide, a Burroughs novel, the initiation fee, and the yearly dues. 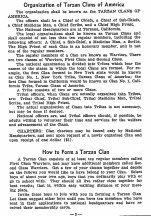 In your letter of March 20, 1962, you inquired about the Clan Guide Book for the TarzanClans of America. 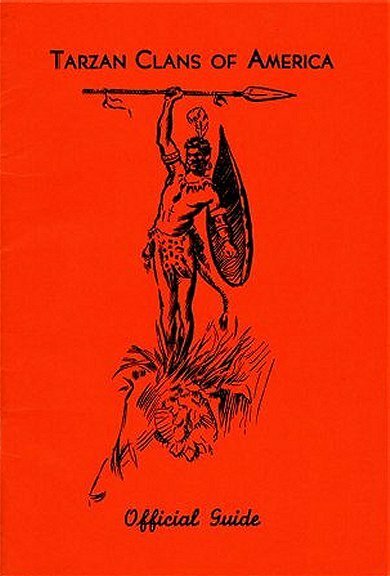 My brother states that all of the contents were written by Edgar Rice Burroughs and that the cover design was drawn by my brother, John Coleman Burroughs, adapted from one of J. Allen St. John's illustrations. The sketch of a spear appearing on page 25 was drawn by my brother. John says specifically that E.R.B. 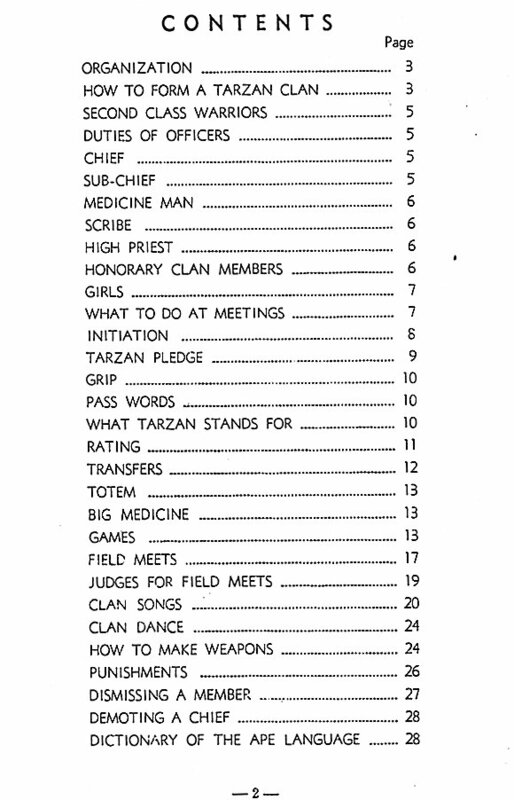 prepared the dictionary of the ape language appearing on Pages 28 through 32. To the best of our knowledge, your assumptions are correct that the Tarzan Clan idea was an experiment which for one reason or another never actually became airborne. was copyrighted in 1939 by Edgar Rice Burroughs, Inc. The contents of this 32-page booklet were for the information of members only. Additional copies could be purchased by members from the National Headquarters in Tarzana on receipt of 25 cents. 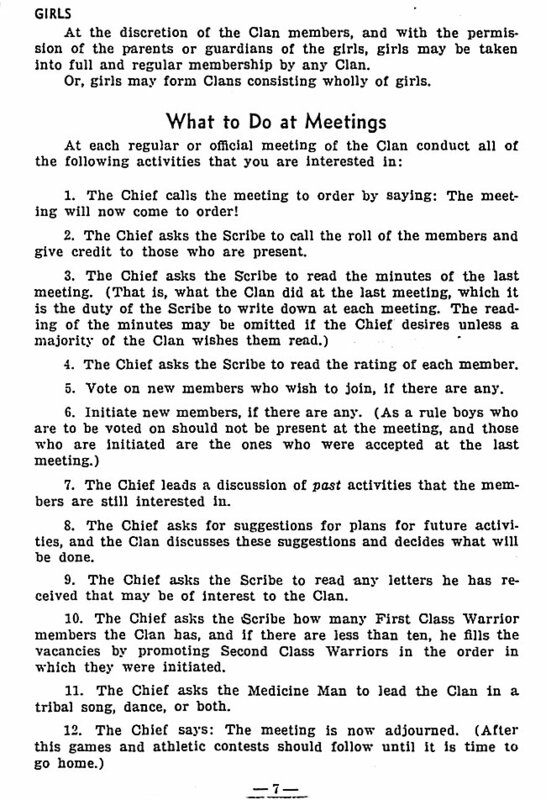 The contents page featured sections on: how to form the clan and run meetings, the various titles of officers and members, initiation procedures, pledges, handshakes, passwords, games, field meets, clan songs, dances, weapons construction, discipline, and an ape language dictionary. 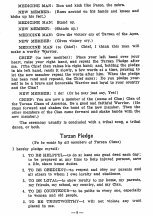 The Tarzan Clans of America: The officers consisted of Chief of Chiefs, a Chief of Sub-Chiefs, a Chief Medicine Man, a Chief Scribe, and a Chief High Priest. 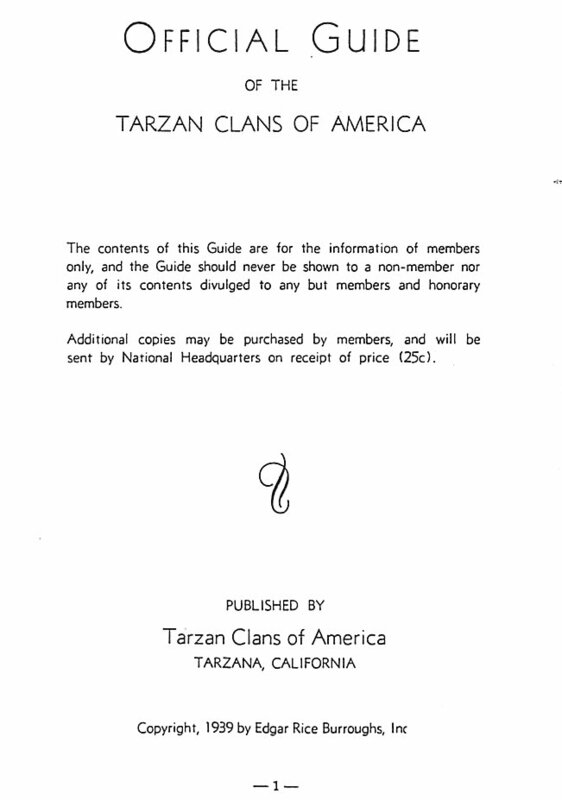 The National Headquarters were at Tarzana, California and the local organizations known as Tarzan Clans consisted of not less than ten members. 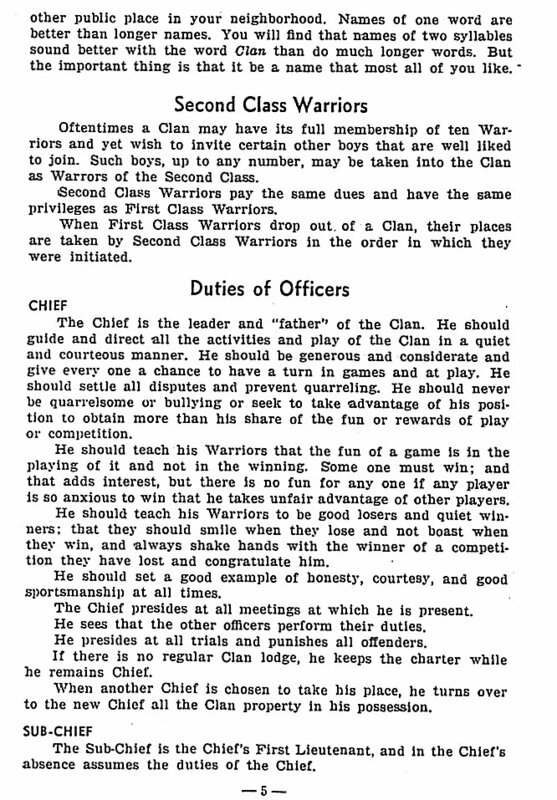 The regular members were known as First or Second Class Warriors. Each Clan had to choose a name -- usually based on a character from an ERB book, an animal or someone famous. At the discretion of the Clan members, and with the permission of the their parents, girls could be taken into membership by any Clan. The national organization was divided into Tribes consisting of two or more clans which bore the names of the states in which the local Clans are formed. The first thing to do at the first meeting was to elect officers. A new election of officers was held every six months. 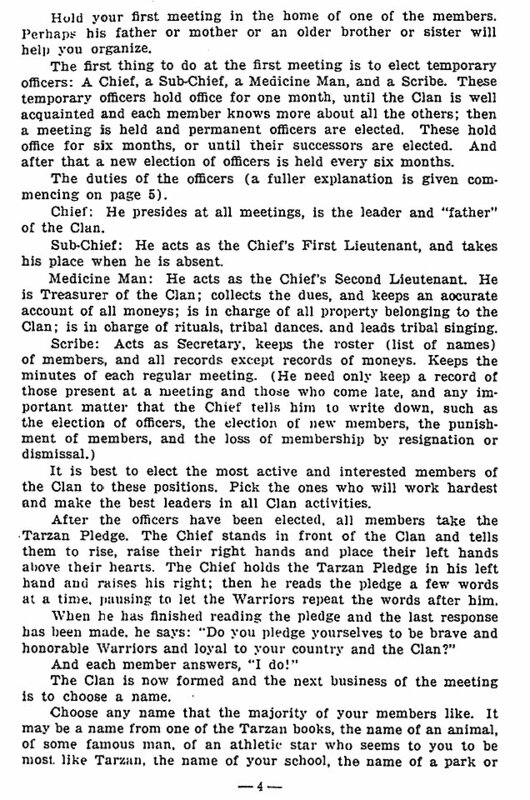 The Chief was the leader and “father’ of the Clan who presided over all meetings. The Sub-Chief acted as the Chief’s First Lieutenant. The Medicine Man was the treasurer of the Clan and was in charge of rituals, tribal dances, and the leading of tribal singing. The Scribe was the secretary who kept the roster, minutes and club notes. 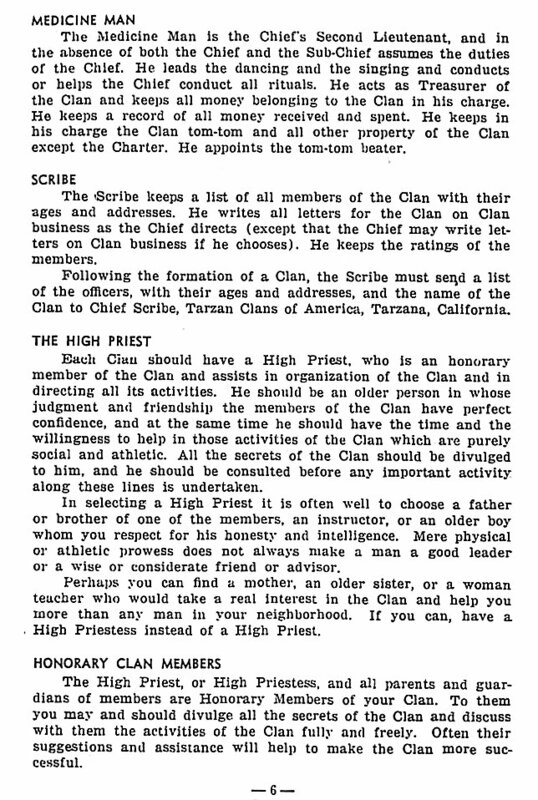 It was recommended that each Clan have an older person act as High Priest or Priestess, who was an honorary member and was to assist in organization of the Clan and in directing all its activities. 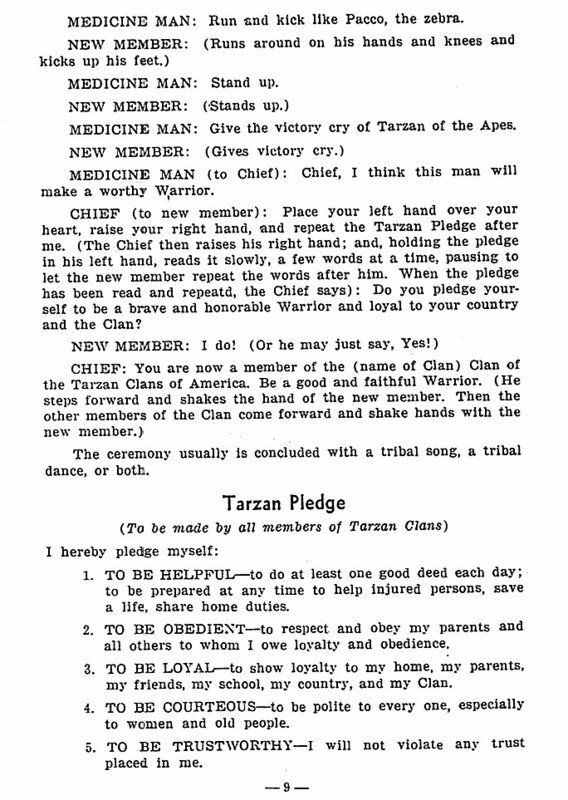 All new members raised their right hands, placed their left hands over their hearts and took the Tarzan Pledge of loyalty to country and clan. They pledged to be helpful, obedient, loyal, courteous, trustworthy, cheerful, careful, clean, respectful of the government, and to never reveal any secrets of the clan. 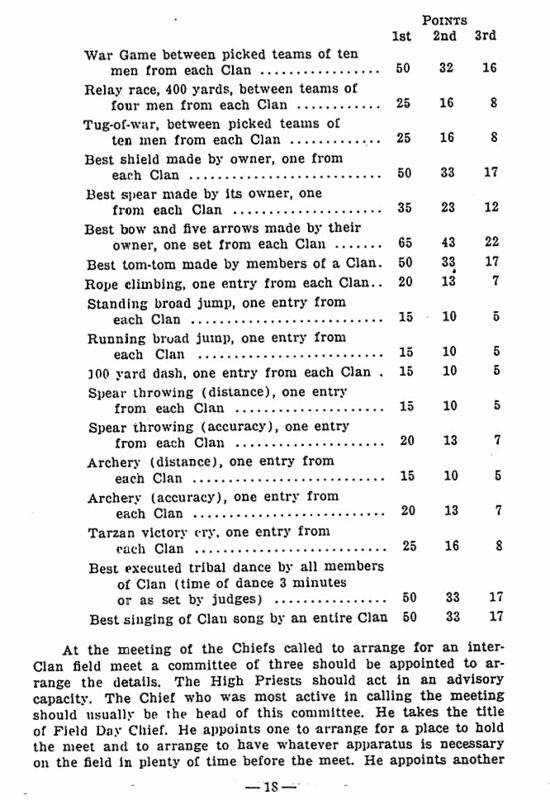 The handbook gave step-by-step procedures on how to run a meeting. Each meeting concluded with tribal songs and dances, followed by games and athletic contests. 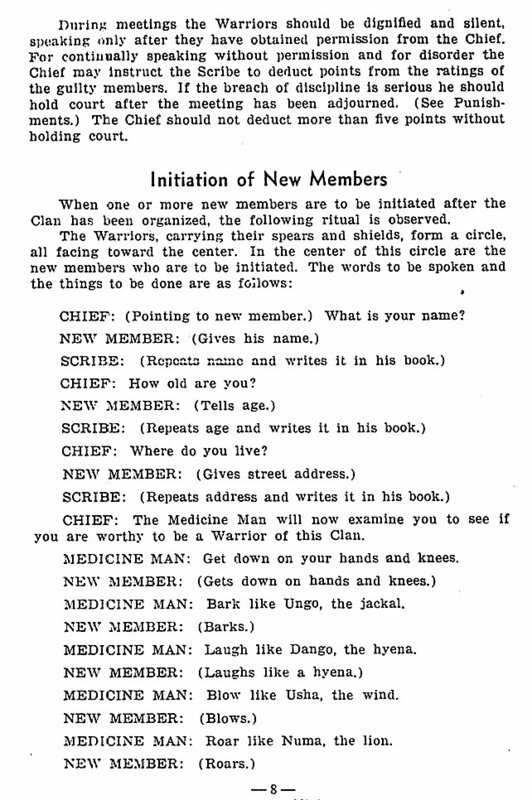 There was also a ritual outlined for the initiation of new members which involved barking like a jackal, laughing like a hyena, blowing like the wind, roaring like a lion, running an kicking like a zebra, and giving the victory cry of the apes. 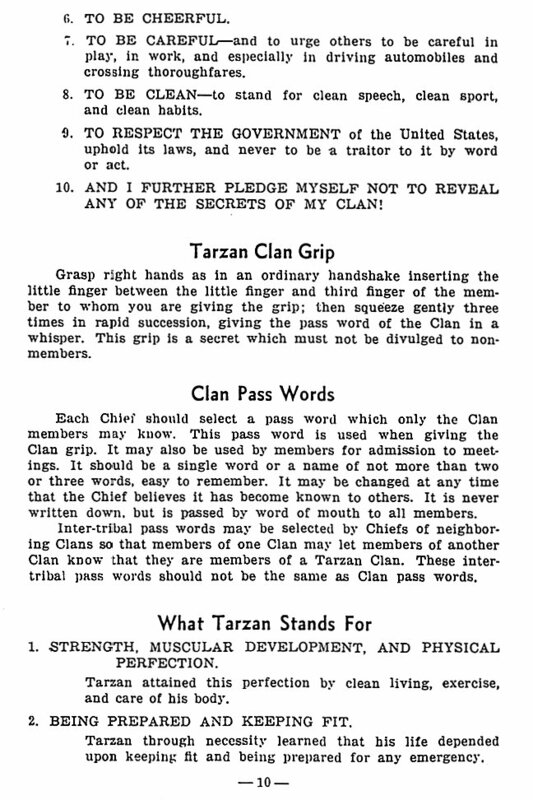 The secret clan grip involved the grasping of right hands as in an ordinary handshake, inserting the little finger between the little finger and third finger of the other member; then squeezing gently three times in rapid succession, giving the pass word of the Clan in a whisper. 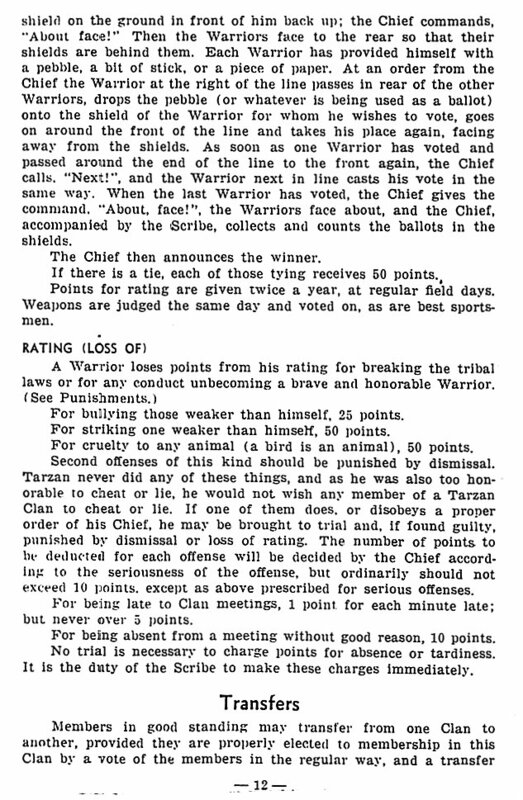 Each Chief was to should select a pass word which only the Clan members may know. 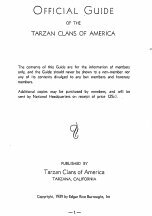 Each member believed that Tarzan stood for: strength, muscular development and physical perfection -- being prepared and keeping fit -- cleanliness -- protection of the weak -- loyalty and friendship. 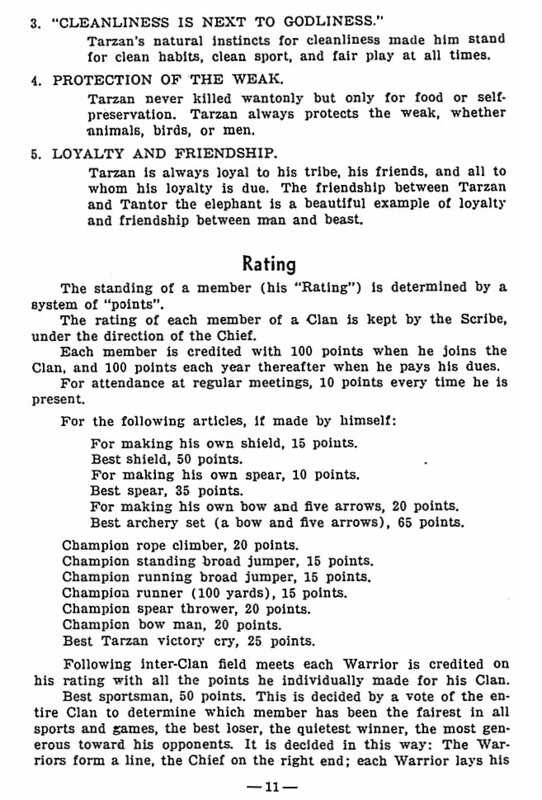 A clan member's rating was determined by a system of "points" kept by the Scribe. Points were earned by paying dues, attendance, making shields, spears, bows & arrows, climbing, jumping, running, spear throwing, archery and sportsmanship. These rating points could be lost through bad behaviour: bullying, striking weaker people, cruelty to animals, cheating, lying, disobedience, lateness, and absences. 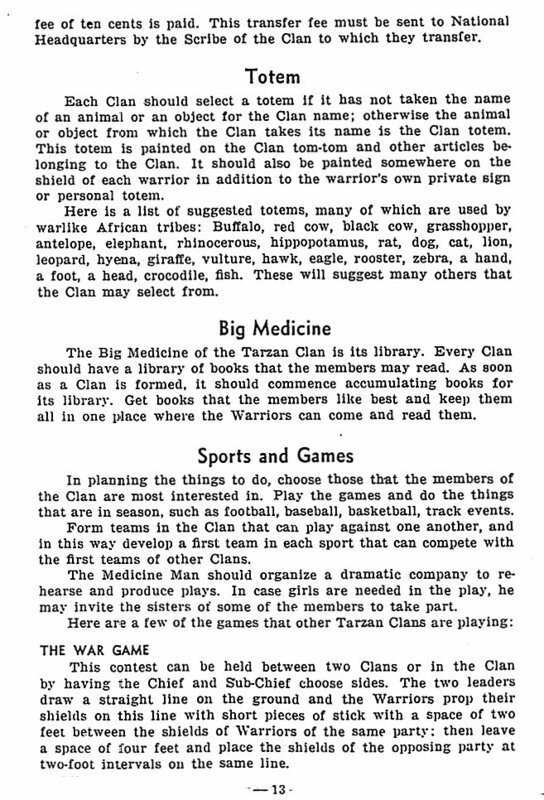 TOTEM -- Each Clan was to select a totem (animal or object) which was to be painted on the Clan tom-tom, warrior shields and other articles belonging to the Clan. THE BIG MEDICINE of the Clan was its library and every Clan was advised to commence accumulating books for its library. THE WAR GAME between two teams of warriors in which each tries to knock over lined up shields of the other with spears or arrows. 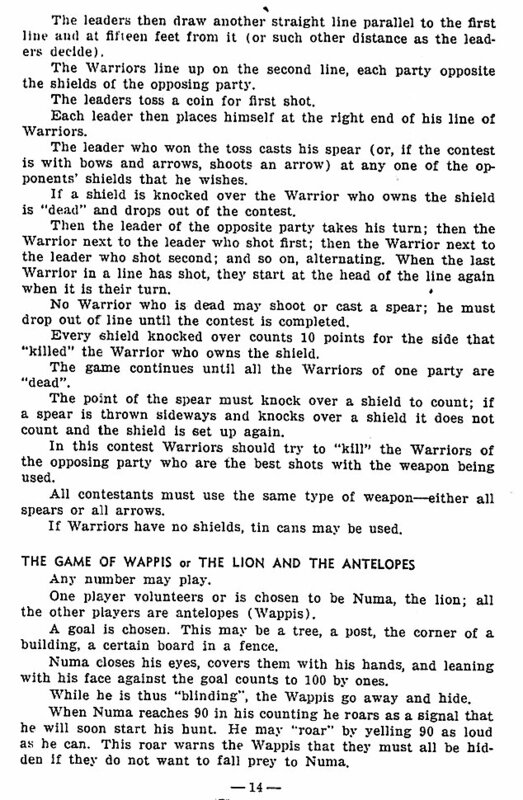 THE GAME OF WAPPIS or THE LION AND THE ANTELOPES was a type of hide-and-seek where numa tried to find hiding antelopes. 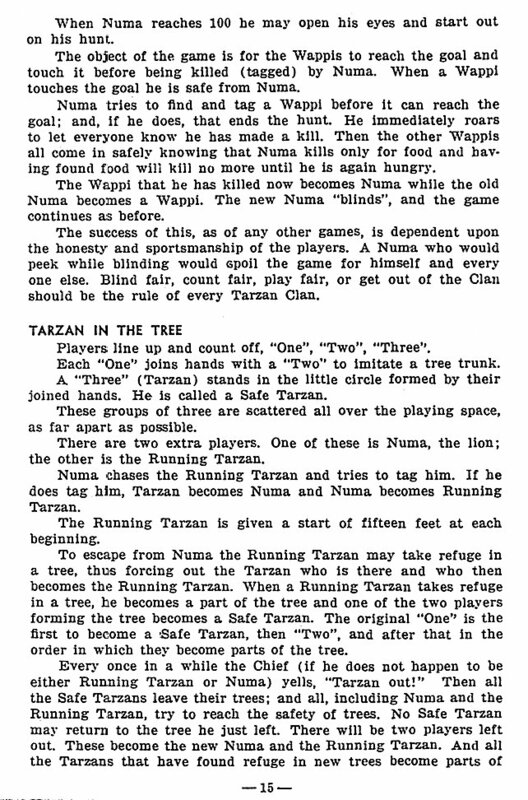 TARZAN IN THE TREE was a form of tag in which numa chased Tarzan who could find safety when he reaches pairs of players who are designated "trees". JUNGLE DIN involved groups of players who took on names and sounds of animals and who had to search for hidden objects. ANIMAL NAMES - Players had to name and make sounds of animals suggested by letters of the alphabet displayed on pieces of cardboard held up by the leader. 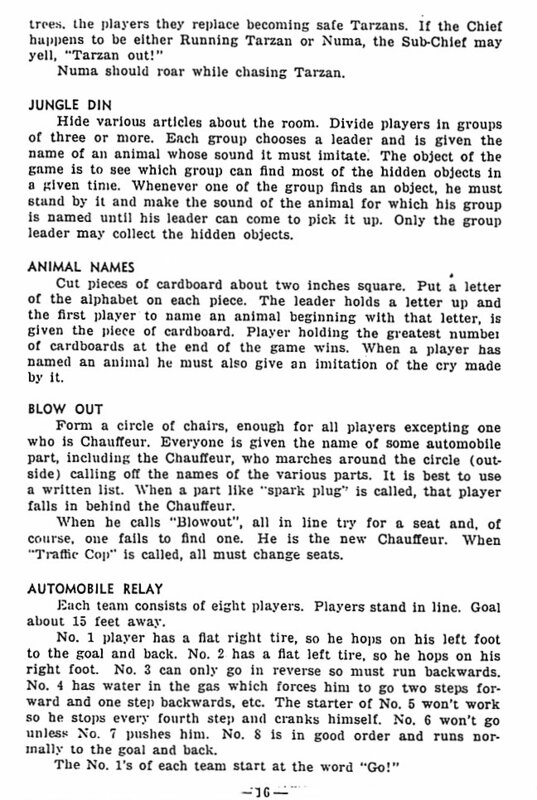 BLOW OUT was a variation of the musical chairs game in which each players was given the name of an auto part and had to leave their chairs and follow the Chauffeur when that part was called out. When the Chauffeur shouted "blowout" the player who couldn't find a seat would become the new Chauffeur. AUTOMOBILE RELAY Each member of teams of eight pretended to have a different auto breakdown in the race - ie. a flat right tire suggested that that team member would hop on his left foot. Other handicaps included: flat left tire, no forward gear, water in the gas, and faulty starter. 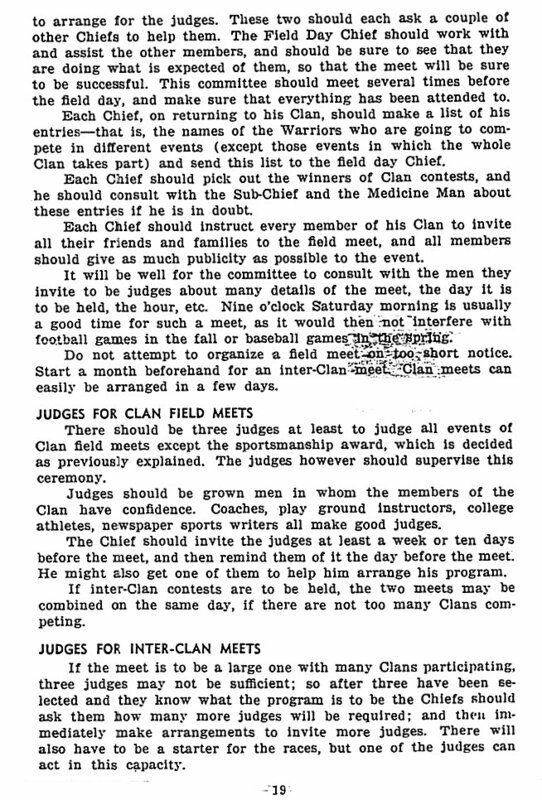 CLAN FIELD MEETS (May and October) -- (At least three adult judges were recommended for the meets.) 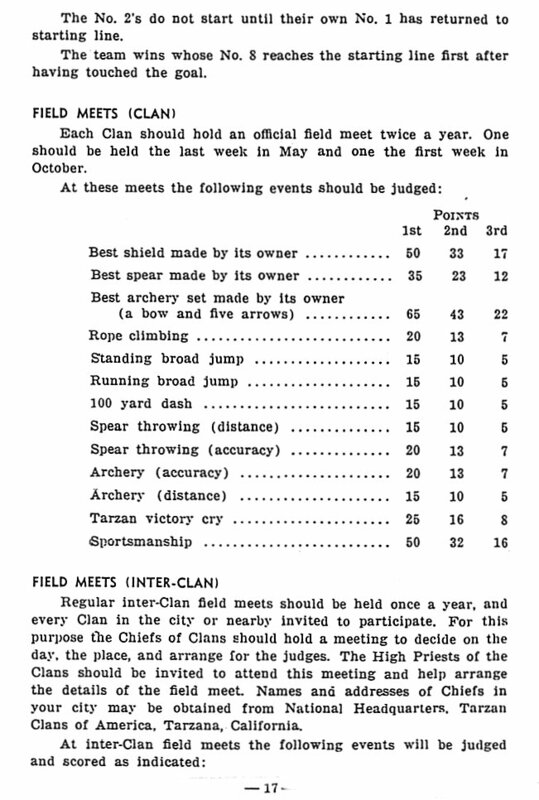 Players gained points by entering the following events: best shield, spear or archery set constructed by its owner, rope climbing, standing and running broad jump, 100 yard dash, spear throwing, archery, ape victory cry, and sportsmanship. ANNUAL INTER-CLAN FIELD MEETS featuring events such as War Games, relay race, tug-of-war, best shield, spear, archery set, and tom tom, rope climbing, broad jumps, 100 yard dash, spear throwing, archery, victory cry, tribal dance, singing of the Clan song.